Calculations at a right regular pyramid. This is a pyramid with a regular n-gon as base. Right means, the apex is directly above the centroid of the base. 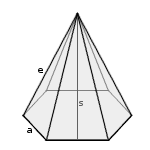 Enter side length, height and number of vertices of the base. Choose the number of decimal places, then click Calculate.